This Thursday, June 16, 2016, from 11:45 a.m. to 1:45 p.m. at the Montreal Science Centre, a panel on hydrogen and its final position in the energy landscape of the future will be held. Minister Pierre Arcand is one of the speakers. Members of the panel are: Richard Chahine, director of the Institute for Hydrogen Research in Trois-Rivières, John-Paul Farag, Director of the Advanced Technologies and Traction Groups section at Toyota Canada, Pierre Gauthier, of Air Liquide, hydrogen producer for oil refineries, and finally Denis Leclerc, president of Ecotech Québec, represents the clean energies cluster of Quebec. During the day, some car reviewers will try the Toyota Mirai hydrogen fuel cell car. Mr. Arcand’s presence may suggest an announcement for a project with possibly a government investment. Before this event, given the limited understanding of our politicians, I find it necessary to dot the «i’s» once again. It should be noted that much of the following information is archived on this blog in my multiple articles on hydrogen technology, and that the information is also available in my book “Driving without oil” (Rouler sans pétrole, 2008) which includes a comprehensive chapter on hydrogen, and more recently in the book “The Electric, Hybrid and Energy Efficient Car” (L’Auto électrique, hybride et ecoénergétique, 2016) in a 4 page article that I wrote on the subject. And that’s not counting others who have repeated warnings about this false solution for transportation, in various media, scientific journals and research reports. The hydrogen car is much more expensive than the battery electric car, both for the car itself, and for hydrogen vs. electricity cost, especially for the hydrogen supply infrastructure. A plug-in gas hybrid such as the Chevrolet Volt (electric range of 85km), emits far less greenhouse gas than a hydrogen car in Quebec, can do more than 90% of kilometers on electricity, be refuelled occasionally with gas in less than 5 minutes and use gasoline only outside the cities. Proponents of hydrogen cars did not anticipate the fast pace of battery development (price, performance) or the arrival of Tesla Motors, which already offers 450 km of range for its electric cars and a free supercharger network, paid for by Tesla (not the government). Let’s see these points in finer detail. But first, here’s a very well done YouTube video that demonstrates quite clearly the nonsense of the hydrogen option. Several government laboratory studies compared greenhouse gas (GHG) emitted in the life cycle of the different “fuels” (gasoline, electricity, hydrogen) used by conventional cars, battery electric cars and electric fuel cell cars. Suffice to mention two: that of the National Renewable Energy Laboratory (NREL) entitled “Hydrogen Pathways”, published in March 2013, and that of the Oak Ridge National Laboratory (ORNL) published in the journal Energy in 2014 under the title “Well -to-wheel analysis of Direct and indirect use of natural gas in passenger vehicles.” The NREL study is available online here, and that of ORNL here. As you can see, and that’s what I’ve said before, GHG emissions with the hydrogen car and the hybrid gasoline car (non-plug-in) are similar. And, with renewable energies that will gradually take over (this is already the case in Quebec), greenhouse gas emissions are much lower for a battery electric car. The hybrid car emits 190 g of CO2 / km, from the oil well to the vehicle wheels, which translates to 305 g CO2 / mile, number I will use to compare with the results of the NREL report. In that report, the GHG emissions related to different ways of producing hydrogen are plotted in Figure 7.0.9. I added to this chart a thick blue line showing the emission of 305 g CO2 / mile for a hybrid gasoline car, which I mentioned above (taken from the ORNL article). Again, we see that a fuel cell car with hydrogen produced from natural gas (by far the most used technology) emits as much greenhouse gas as a hybrid gasoline car like the Prius, for fuel life cycle. QED. This time I refer you to a detailed study by Ulf Bossel and published as a guest article in the prestigious journal Proceedings of the IEEE (Institute of Electrical and Electronics Engineers) in October 2006 (see here). In this article, entitled “Does a Hydrogen Economy Make Sense?”, Figure 9 below is very explicit. It shows that, ultimately, the inefficiency of water electrolysis to produce hydrogen is simply unacceptable. It takes 3 times more electricity to do the same thing. This wasting of precious renewable energy, makes no sense. And don’t forget that sustainable development is synonymous with energy efficiency. This means that the production of hydrogen by water electrolysis is not sustainable development. Price wise, hydrogen cars will sell for around 60 000 US $, meaning $ 20 000 to 25 $ 0000 more than electric cars with a 320 km range such as the Chevy Bolt and the Tesla Model 3 . Regarding the cost of hydrogen, it is expected to approach the cost of gasoline to travel the same distance, or may even be more expensive than gasoline, while the cost of electricity is 4-6 times less than the gasoline ($ 1.10 / liter at 8 liters / 100 km), depending on location. Therefore, if one can recover the additional cost of the battery electric car with fuel economy, this will not be possible with hydrogen fuel cell cars, especially since the purchase price is even greater. Regarding hydrogen refuelling stations, a detailed study by the National Renewable Energy Laboratory (NREL) in the US in 2013 and entitled “Hydrogen Station Cost Estimates” established that it would cost 2,8 US $ million in 2016 to build a station capable of supplying 333 kg of hydrogen per day, about sixty fills for a car like the Mirai. The report is available here (see Table 3, page 5). For comparison, a fast charging station costs less than $ 70,000 to install and can fully recharge about thirty BEV per day. And don’t forget that the vast majority of recharging for electric cars is done at home or at work, without having to go to a gas station. These exorbitant costs of infrastructure to refuel with hydrogen would be in great part paid for by governments, therefore indirectly by the citizens. And it is obvious that the money poured into this new infrastructure would limit public money available for charging stations for battery electric vehicles. That is why I say that hydrogen cars could hinder transportation electrification. The main selling point of hydrogen cars, besides the absence of pollution during use, is refuelling in 5 minutes for a range of 500 km. But hydrogen car proponents are careful never to compare with a plug-in hybrid car like the Chevrolet Volt. The latter can do more than 90% of its travels on battery alone and consume on average 0.5 liters / 100 km. Furthermore, one can fill the gas tank in 5 minutes, if necessary, for a total range (battery + gas) of 670 km. Plus, the infrastructure is already in place for gas, so there’s no need to pay for anything. And the 10% of kilometers that will be driven on gasoline will be very largely outside cities, on long journeys, since the electric range of the Volt in 2016 is 85 km. In places where power grids are very clean, such as in Quebec, a car like the Volt will emit far less greenhouse gases than a hydrogen fuel fell car, possibly 10 times less (0.5 L / 100 km vs 5 L / 100 km). And elsewhere in the United States and Canada it is substantially equivalent for the vast majority of people. Proponents of hydrogen vehicles had not expected that Li-ion batteries would evolve so quickly, nor the emergence of Tesla Motors. Who would have imagined the arrival of a major player like Tesla Motors, which has changed the game in electric mobility by offering battery vehicles with a range of 450 km, and a broad network of free superchargers capable of delivering 220 km of range in 25 minutes? And who would have expected to see 400,000 bookings for the Tesla Model 3 at 35,000 US $, each with a $ 1,000 deposit, within one month of unveiling? In the last 8 years, the price of Li-ion batteries for electric vehicles has decreased from $ 1000 / kWh to $ 200 / kWh, energy density has doubled and the useful life and power of batteries have increased greatly. And development is ongoing. In 2 to 3 years we will see even more powerful superchargers than the Tesla ones for all electric vehicles. Hydrogen car technology is too far behind to catch up with the efficiency of battery electric vehicles. With the facts presented here in mind, it is justified to ask: who will want to buy a hydrogen car, at a much higher price than a battery electric car, pay over than 5 times more than electricity for hydrogen in the rare gas stations offering this fuel, with no real environmental gain? To ask the question is to answer it. So, watch out governments, do not put electrification of transportation at risk by investing in a technology that is obviously losing and that would siphon a lot of taxpayers’ money. Car manufacturers can not change the laws of physics by investing billions $ nor can governments do so with subsidies. And I haven’t even talked about the danger of developing a large-scale hydrogen, a highly explosive gas, distribution network that would require 15 times more trucks on the road to supply the stations than for the current number of gas trucks we already have for gas ! (see article by Ulf Bossel cited above). This article is a translation of «Les voitures à hydrogène pourraient nuire à l’électrification des transports» published on RoulezÉlectrique.com. Pierre Langlois holds a PhD in Physics from Laval University (Quebec, 1981). He also has twenty years of experience in various industrial research institutes and university laboratories in Canada and France, as a researcher and then as Department Head. In 1997, he took an independent path as a consultant and became more involved in scientific communication by becoming a writer. His first two books, «Sur la route de l’électricité» vol. 1 (2005) et vol. 2 (2006), earned him a Special Jury Mention for the Prix Roberval 2008 in Paris. This prestigious competition recognizes the best French speaking countries’ works in scientific and technical communication. As of 2005, Pierre Langlois focused his attention on transportation and energy solutions. His third book «Rouler sans pétrole» was published in November 2008. The Quebec Engineers’ Network mandated him in 2010 for a study: “Proposals to engage Quebec on the road to sustainable mobility”. He also was advisor to the Quebec government for its strategy on transportation electrification from 2013 to 2017. 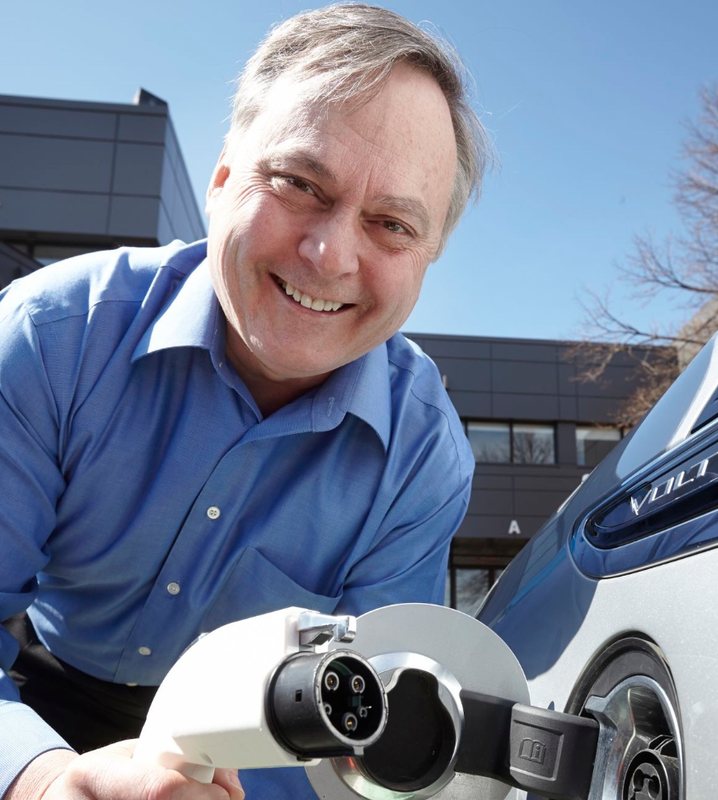 Awarded with the Medal of the National Assembly (Quebec) for his significant contribution to the transportation electrification, in April 2014, he continues his involvement in sustainable transportation through the RoulezÉlectrique blog, articles, lectures, training and media interviews, in addition to being a consultant in sustainable mobility.